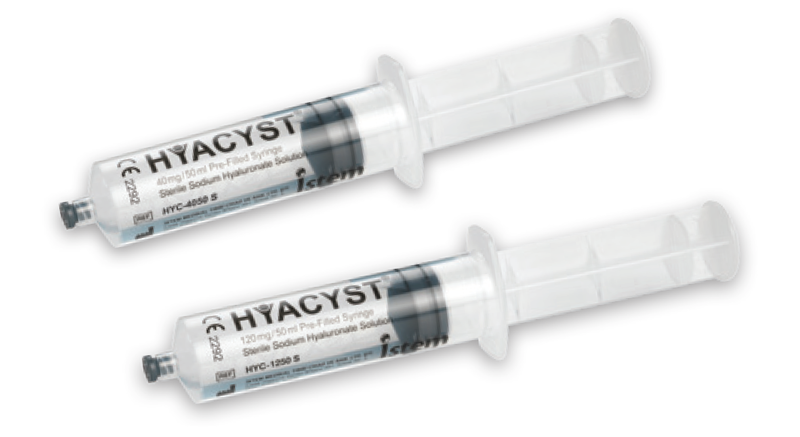 Hyacyst® (sodium hyaluronate) 40 PFS is the only sodium hyaluronate bladder instillation in a pre-filled syringe. Hyacyst® (sodium hyaluronate) 120 PFS is a higher dose option when increased replenishment of the GAG layer is required. In a 2014 randomised study, Hyacyst® (sodium hyaluronate) 120mg/50ml was proven to be as effective as combination treatment (iAluRil®) in reducing symptoms in patients with IC/PBS1.